Nagpur/Yawatmal: A Day after the Nagpur Bench of Bombay High Court sought to know from the Forest Department why the tigress T1 ( Avni ) from Pandharkawda hasn’t attacked anyone from August 28 if she was a habitual man-eater, T1 was physically seen and also captured on camera trap. The tigress, incidentally, passed close to the Forest Department base camp at Sarati village around 9 pm on Tuesday and was captured on a trap camera there. On Wednesday morning, she killed a cow belonging to farmer Vitthal Thakre from Sarati in compartment number 157 around 10 am. The farmer panicked and rushed to the camp and informed the authorities. A team three trackers, veterinary doctor Ravi Khobragade and shooter Shafat Ali Khan and his team rushed to the place. When the trackers went inside the forest along with the farmer, the tigress ferociously growled and charged at them. “It was extremely risky and hence virtually impossible to tranquilize the tigress,” sources said. Shockingly, the tigress appeared to have walked the road close to the camp situated at the opening of compartment number 150 and headed towards Sarati village. “We spotted her pug-marks just about 200 m from the village which is quite an ominous sign. 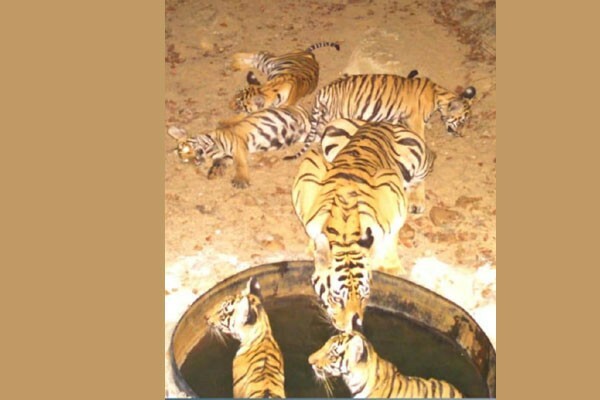 It means the tigress could be back to her aggressive ways after we have strategically reduced patrolling and tracking pressure to lure her out of her hiding,” sources said. The situation is poised to become precarious under the circumstances once again as the farmers can still be seen watering their farms at night when they get the power supply. On Monday, one of the cubs of the tigress was spotted by a tracking team near Anji village.